Tarzan’s Three Challenges - Blu-ray Review - ReDVDit! 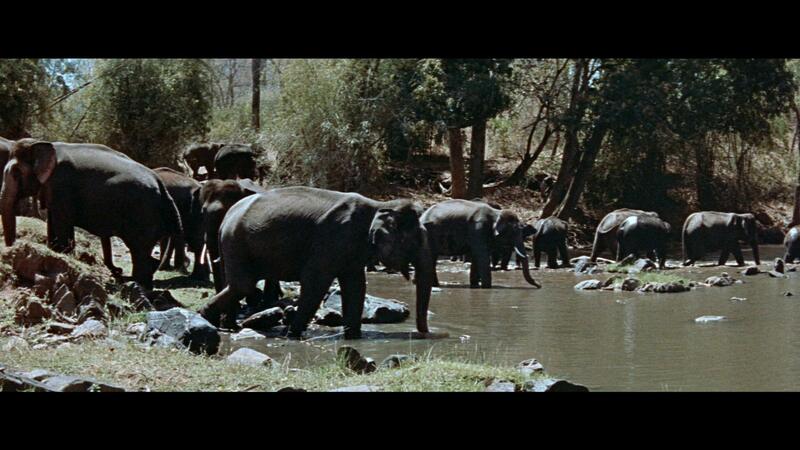 Tarzan’s Three Challenges is a 1963 British-American adventure film that was filmed in Metrocolor. It is a follow up to the 1962 title, Tarzan Goes to India. The film was Jock Mahoney’s second and final turn as the apeman, and it was produced by Sy Weintraub, written by Berne Giler, and directed by Robert Day. 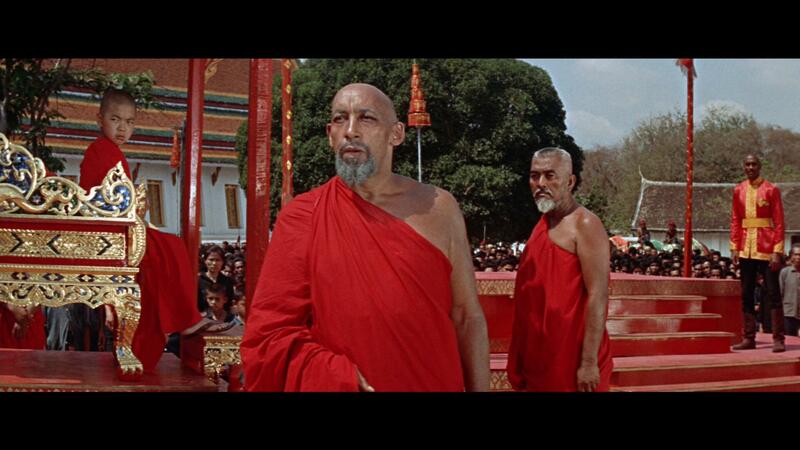 The film was released in June 1963. 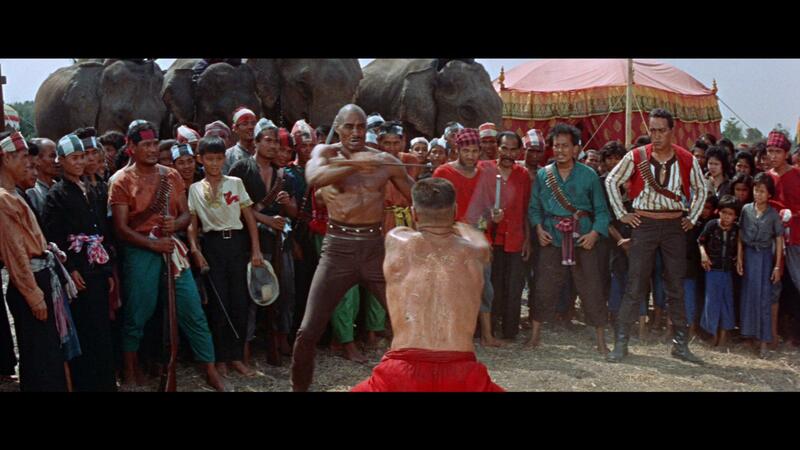 The movie starts off with Tarzan, of Africa, as he is summoned to an unnamed Asian country to protect Kashi, the youthful heir to the throne, from his evil uncle, Gishi Khan, who is played by the Tarzan veteran Woody Strode. 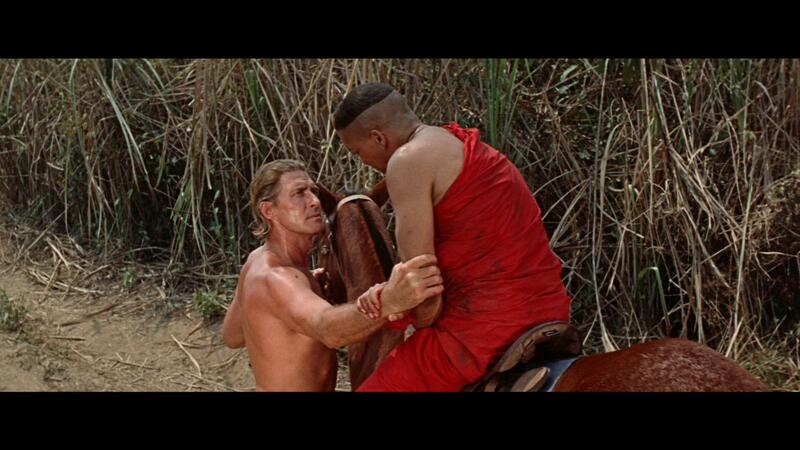 Arriving by parachute from a light airplane and armed with a Spanish bolo hunting knife, Tarzan dons monk’s robes and travels by boat to a monastery. 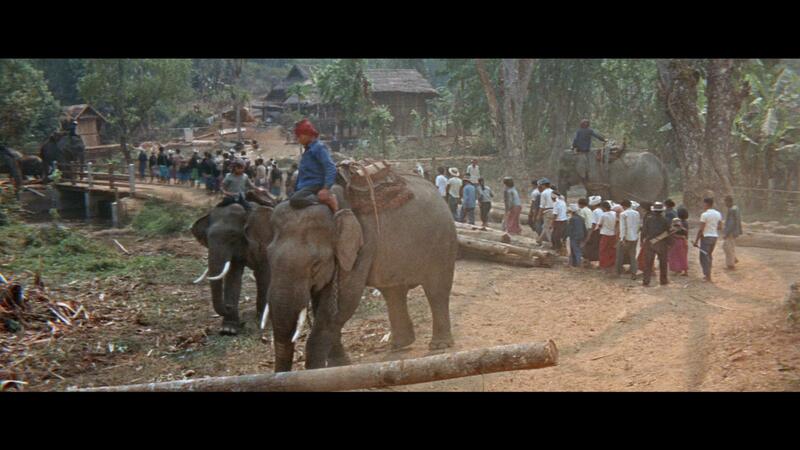 The film was shot near Bangkok, Thailand and in the jungle near the Chiang Mai province. 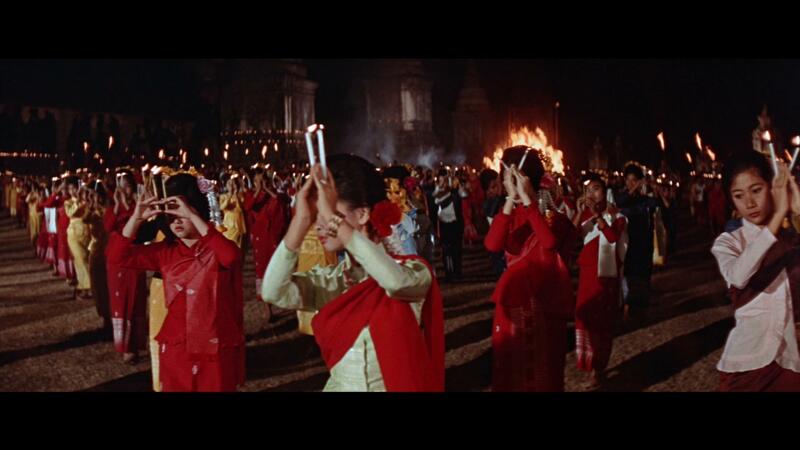 Some of the scenes were shot in the Temple of Buddha’s Footprint. Various crew and cast members removed their shoes and shot the film while in almost total silence. Midway through filming, Mahoney had contracted dysentery, dengue fever, and pneumonia and is weight immediately dropped from 220lbs to 175lbs. Some critics noted how thin and weary he appeared in some of the action sequences, and indicated that it undermined the credibility of the film. Tarzan’s Three Challenges is an adventure that takes our beloved jungle hero Far East as he’s been summoned to Thailand to help protect the youthful heir to the throne, Kashi, and help to keep things in motion as the spiritual leader for the country is fading into his final days. As he ventures through the country, he’s faced with three challenges from Khan that he must endure, and I can’t lie, some of these challenges were pretty gnarly and more than enough to make my wife and I wince our noses as they posed their strain on Tarzan; with a fourth and final challenge being a sword fight to the death with Tarzan to serve as the final test to confirm the boy as the legitimate heir. Only one man will survive, while the other perishes. Packing a completely fresh and remastered visual presentation, the Blu-ray release of Tarzan’s Three Challenges gives its viewers a completely re-invigorating display that provides a considerably beautiful look into the scenic glory that is accompanied by a trip of this caliber. With Warner Archive’s restoration efforts, you can certainly tell that there was a lot of tender love and care that was given to the filmic presentation as they worked to clean everything up and still maintain that original experience that was intended. The colorization isn’t too terribly overpowering, allowing for the movie to remain true to the time it was originally released, and overall I couldn’t find any kind of distortion or complaints to be had with the visuals. Packaged with an English DTS-HD Master Audio 2.0 mix, this release of Tarzan’s Three Challenges offers an absolutely cleaner presentation over its previously released counterparts. Adding attention to a lot more of the environmental aspects of the audio track as it rips through the front channels of your home audio system, my wife and I were certainly impressed. Sure, it’s not as immersive as it could have been; but, with he limitations of the source material and the potential problems that I’m sure it posed during the restoration processes, you can certainly tell there was a lot of love and attention paid as this track was processed. The dialogue is extremely clear, and audible enough with a small increase in the volume levels, and my wife and I were able to hear and understand everything without an issue. 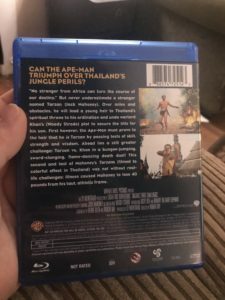 The Blu-ray release of Tarzan’s Three Challenges comes packaged in your standard single-disc Blu-ray amaray case. Within that case, the standard Blu-ray copy of the movie. The disc features the same piece of artwork that’s been included on the cover. There are no DVD copies included with this release nor are there any digital copy redemption pamphlets. There are also no slipcovers available with this release. Unfortunately, there are no special features included with the Blu-ray release of Tarzan’s Three Challenges The Blu-ray does come with the original theatrical trailer for the feature film; which was a nice piece to visit … but, I do not consider this lone item to be a “special feature” and will not be rating it accordingly, and as a result, I have removed the rating from this section. Overall, I was genuinely surprised with Tarzan’s Three Challenges. Sitting down with this, I had some pretty low expectations given the number of Tarzan films that are out there, and ended up finding myself not able to pull my eyes away from the television. It wasn’t until I did some research on this film that I personally recognized the historical importance in that it was the second of two Mahoney Tarzan films. The audio and video presentation of the Blu-ray release were exceptional and offered a really fresh take on this story that’s approaching nearly 60 years in age. I would have liked to have seen some special features included, but I can’t really complain about their not being there as there rarely are any included with these releases. If you’re considering this release for your collection, I’d definitely recommend grabbing it if you’re a fan of the Tarzan storylines. 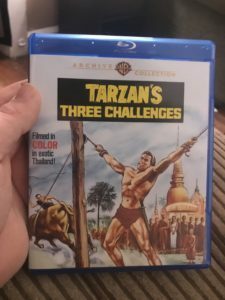 Tarzan’s Three Challenges is available on Blu-ray.